Sunday 25th October was St Crispin’s Day. Henry V is structured around that day because October 25th was the day on which Henry defeated the French at Agincourt. It’s also the day on which two other celebrated battles were fought: the Battle of Balaklava in the Crimean War, immortalised by Tennyson in his poem, The Charge of the Light Brigade, 1854, and the Battle of Leyte Gulf in the Pacific, 1944. 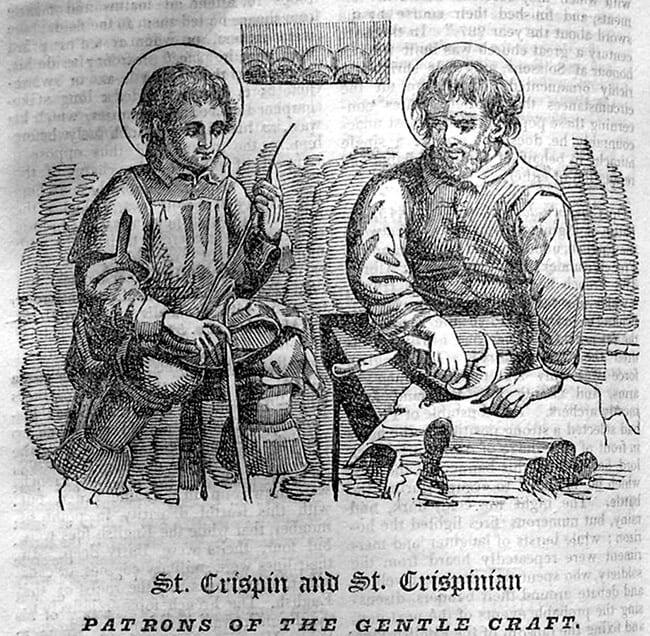 St Crispin’s Day is actually the feast day of both St Crispin and St Crispinian, Roman twins, the patron saints of cobblers – for that’s what they were, teaching the gospels to the Gauls by day and making and mending shoes by night. In modern times they are also the patron saints of cyclists, of all things! Thebrothers fell foul of the authorities because of their Christian preaching and were tortured and beheaded in 256. Strangely, although the majority of recognised saints are legendary rather than historical figures, St Crispin’s Day was removed from the Catholic list of feast days because the Vatican decided that there was little evidence of their existence. There is nothing to stop you from celebrating their feast! Shakespeare is THE MAN Do you know more than Shakespeare?